Abram prides himself on providing practical, cost effective legal advice that detracts from unnecessary conflict and strives towards ultimate resolution. He regularly works with clients and other parties to reach negotiated resolutions or, where not possible, outcomes through the use of other non-judicial avenues like arbitration. With nearly a decade of civil and commercial litigation experience, he also brings a strong litigation background with significant courtroom experience, having successfully appeared before all levels of Alberta Courts, the Ontario Court of Appeal, and the Supreme Court of Canada. Abram’s commercial litigation experience lends itself very well to the business complexities that often accompany family law. 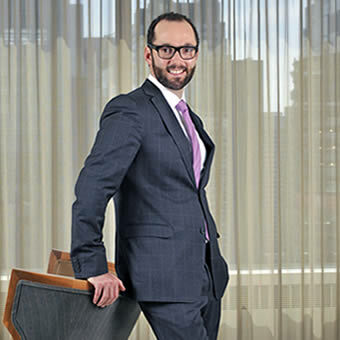 Prior to starting his family law practice, Abram practiced first with a prominent national law firm, Blake Cassels & Graydon LLP, and then with a major Western Canadian regional firm, MacPherson Leslie & Tyerman LLP. He has experience working with all ranges of business structures, from sole proprietorships to complex multinational corporations, advising on a wide range of corporate/commercial matters, including shareholder disputes, employment issues, construction disputes and oil and gas litigation. Abram earned his B.A. (Honours) from the University of Western Ontario in 2002. He earned his Bachelor of Laws from the University of Manitoba in 2007.